Yes, I know I have written that before, but this year’s Shellabration was superb. What makes a great Shellabration? Mild weather with sunny skies, participants, both vendors and visitors ready to have fun, and some great food and wine. We lucked out in every category. For December, the day was warm enough to sit out and enjoy a Stout before we Shellabrated in earnest. 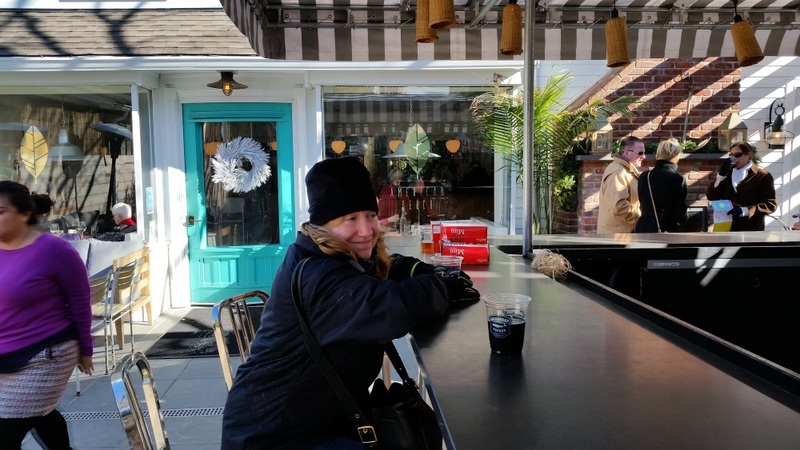 Here is Marian enjoying a Greenport Harbor Brewing Company Oyster Stout outside of American Beech in Stirling Square. We register for Shellabration online, so the fun starts for us when we pick up our bracelets, map of participating venues, and tickets for a draft brew and some freshly shucked oysters. This year we began at the Greenport Harbor Brewery, where the shuckers and a friendly SPAT representative were busy at work. 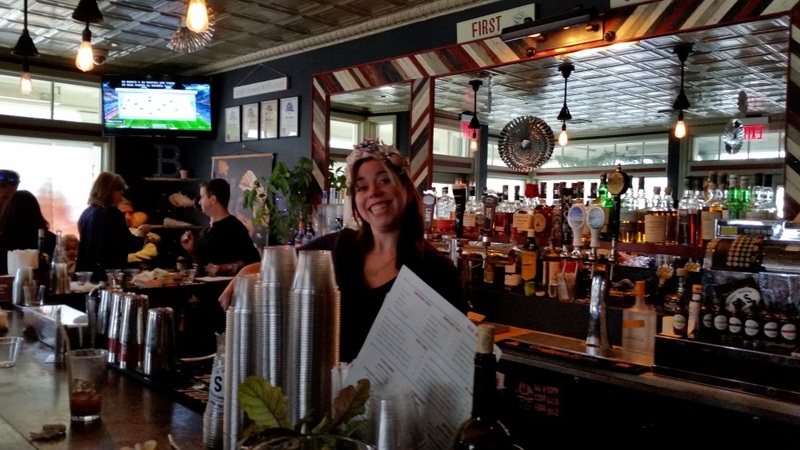 American Beech is a beautiful bright venue with a great bar and friendly waitstaff. The scallop mousseline was amazing and the Lieb Cellars Pinot Blanc paired beautifully. Here you can see the plating and Julia working the bar. Step out the door of American Beech and you see Basso before you. Cicchetti e Specialita is their tag line and the raw bay scallops and razor clams on grilled bread were certainly Specialita. The last time I had razor clams, I was in Portland Oregon. Delicious and different. Naturally the scallops were sweet and delicious. We enjoyed both, paired with McCalls‘ un-oaked chardonnay. We’re just getting started… let’s go! Stirling Square is packed with good food. Yes, right outside of Basso is the 1943 Pizza Bar. They have one of those terrific wood-burning brick pizza ovens, but today’s action was all about scallops. In this case they were wood smoked in the oven, and served on a bed of caramelized leeks. Wow, this combo was spectacular. We enjoyed the dish with Paumanok Vineyards‘ Sauvignon Blanc, a great pairing. Despite the name, Stirling Sake is not in Stirling Square. It is right up the street and we were glad to take a stroll. We have visited Stirling before and loved the sake and sushi, so we expected something terrific. Chef Yukio delivered. His raw bay scallops were served in a citrus ponzu sauce along with a shot of cask sake served cold. No, Impulse doesn’t serve food, and it was not an official Shellabration “special offer” store as were many others. However, it was right down the street from Stirling Sake, and it has neat clothing and jewelry that Marian likes. Store manager Debbie was friendly and got into the spirit of Shellabration by spinning a “discount wheel of fortune” for purchasers. Marian enjoyed lots of try-on time and came away with two great pair of earrings. At every prior Shellabration, First & South delivered a great seafood chowder. This time around was no exception. We ordered a delicious smokey chowder and paired it with Macari’s rose. The front room by the bar was full of Shellabrators and there was a line to get in. It is clearly no secret that the food and atmosphere at First & South are excellent. 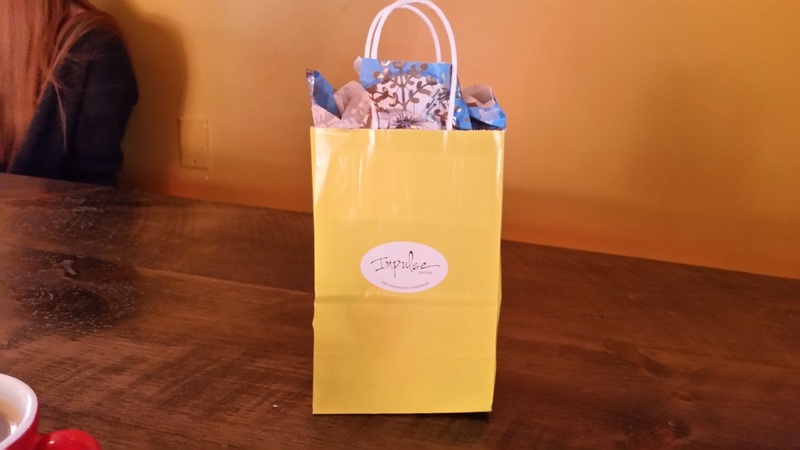 We love the Frisky Oyster and wish that they would be open for lunch. This year the restaurant was full of Shellabrators and we were glad to get a seat and make some new friends among the guests. 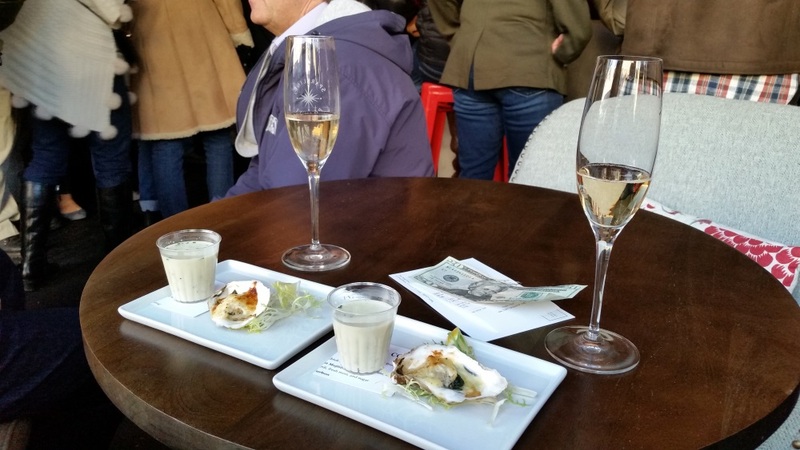 The longed-for Oysters Friskafella were on offer along with a light seafood chowder and coupes of Sparkling Pointe. Delish, as it is every year, we always look forward to this pairing. As usual, we vow to get here for dinner. We were full and the light began to fade at 3:30 pm. After four hours of eating and drinking, it was nearly time to get on the ferry. We took a swing by Little Creek Oysters on Bootleg Alley to say hello to our friends there, and enjoy our last two freshly chucked oysters. This was a stupendous food and drink crawl, and we are looking forward to next year’s Shellabration. Hope to see you there!